Back home in the middle of the country, when the first ice coats the streets the local news goes crazy. They send all of their field reporters out to the salt barn for on the spot news. The salt barn is a giant shed where the city stores its supply of winter road salt. If they declare some kind of “snow emergency,” or the ice occurs close to christmas, there will be so many reporters there that you will be able to see them in the background of each others shots. I find this completely riveting. Mind you, NOTHING is happening there. The most excitement you can hope for is a shot of a plow getting a salt refill. Today i awoke to a cold morning in the bay area. It was below 40 in my backyard, and the local news quickly made it clear that it was below 30 degrees in some of the valleys nearby. And how did they do that you ask? Through ever-fascinating live shots of frost. Yes, frost. They described a light coating of frost as a “winter wonderland.” They also showed a shot of a woman defrosting her car by spraying it with her garden hose. That one really got my attention. Lucky for her it warmed up quickly and i don’t think it had time to re-freeze completely. And the sad thing – I think it is really cold too! They have assimilated me! The chilliness has motivated me to work a bit on the Knitpicks Emma Jacket that I planned to finish in early December. 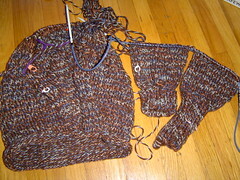 The blob on the left is the body, knit in the round to the armpits and awaiting steeking. The sleeves are on the right with a lovely fold up ribbed cuff. i love the yarn. I think it would look great for cabled projects – a little bit of color, but not too much. I am still undecided about the pattern..
7 Responses to "It’s cold outside (relatively speaking)"
OMG, I saw that same woman. I just laughed and laughed and thought about how much of an ice cube her car if it had been a bit colder. Stupid twit. As if it matters that the top of your car has frost on it. And what is even more stupid is that people were taping it like it was good idea. Made me wonder how my wiper blades are going to handle the trip home. The only wiper fluid they sell around here is not rated for the temps back home. OMG! Spraying her car with a garden hose??? Wow! That oculd have been disastrous! ah yes, the tried and true garden hose defrosting method. also very popular in anchorage. at least, for folks hoping to drive around in a 2-ton ice cube. but don’t beat yourself up for feeling cold there. it *does* feel cold there — largely b/c the houses have little if any proper heating or insulation. (ah, fondest memories of the GFI). and we all know that hypothermia can cause people to behave in dangerously stupid ways. like spraying their frosted car with a garden hose, for example….